Welcome to our Anni-VERVE-sary Spotlight Hops! As many of you know, Verve is celebrating its 5th anniversary this month and the party is just getting started! Come join us over the next 9 days as we showcase the 23 new stamps and dies releasing from Verve! We'll be counting down the minutes and revealing all the new sets in our forum from 9-11pm Eastern on Friday, August 24, so make plans now to join us for our release party! In the meantime, we've got a fun filled hop for you today! So let your fingers do the clicking and peek into the creative minds of Verve's talented Divas and Guest Divas as they give you a little tour of what's to come! Inspiration abounds, and so do the PRIZES! They've picked a mystery blog from today's hop and hidden a prize! So be sure to give a little shout out in the comment section as you hop around to each blog on the list. We’ll draw a random winner from all of the comments on the mystery blog to win today's featured sets and dies. Check out the Verve Blog for all the prize details and deadlines. Want even more chances to win? Head on over to the Verve SCS forum and play along in our Anni-VERVE-sary release challenges. Or hop on over to the Verve Blog to find out about our Verve Card Carnival, for a chance to win the entire new release (a $300+ value)! Great card. Thanks for the tip on making the sun rays! I have so enjoyed seeing your work on this hop. You make the CAS style absolutely stunning. Love how you set off this stamp. What a powerful card with a great message! Wonderful! I love your CAS cards - they are reproducible which makes them encouraging!! So beautiful and love that stamp!!! Thank you for the measurements on the rays/rectangles - this is such a beautiful card!! Stunning. I love how you created the gorgeous sunshine rays. Thanks for the tutorial!! Absolutely spectacular card! Thanks for sharing how you do those wonderful sun rays that seem to be so popular these days! I am very much enjoying your cards this release and super glad to have you designing with Verve. Really, 2x6 rectangles? I'll have to give this a try! I really have enjoyed all your cards and the details in making them - especially the sun rays from today! Keep up the great work. Perfect layout for this sentiment. Great card. What a pretty card --- I love the way you did the rays AND the quote as your focal image! love this card the sun rays are the perfect touch for this sentiment-I love it!! I'm LOVING this CAS card. Very creative and very awesome! 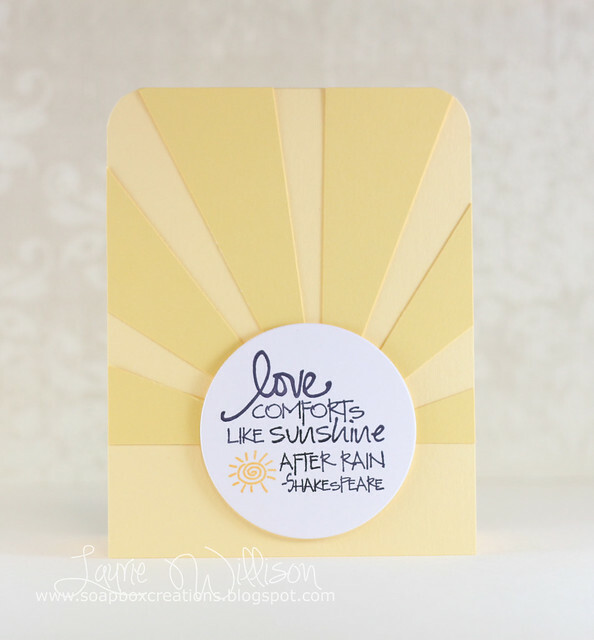 Excellent use of the sun burst die...perfect for the sentiment. Simply stunning. Love the sentiment. nice and simple love it. Gorgeous card. Those rays are beautiful. What a perfect way to showcase this sentiment. This card showcases this sentiment perfectly and is the ideal imagery :) It's gorgeous!! Great card! Your CAS style is always so crisp and well done. Pretty card! Shakespeare & Sunshine, what more could you ask for! Thanks for sharing. Blessings! Great card. Love your CAS style. Thanks for sharing how you did the sun rays. Very creative. Ohhh....this makes me so very happy!!!! Love the design, and the sentiment goes with it perfect!!! Beautiful! I'm off to make some of those cute sun rays now! Absolutely fabulous card! Love how you did the sun rays! This is fantastic, Laurie! Love those rays of sunshine! Sweet card! Great idea with the sunshine rays. I must remember that. Thank you for sharing! I love this card...then again I love any card that has rays on them...still this one is just all around perfect!!! The tone on tone rays of sun are genius! Love it! Love the card. Thanks for the tip on the sun rays. Oh my!!! What a fun card!!! Beautiful sun rays!!! Love this card!!! It's so simple, but it really doesn't need anything else! The sun rays are perfect for the sentiment. You have such a great design sense - beautiful card today. Oh my! Just awesome! The perfect layout for this great sentiment! love! such a great idea! great CAS! Wow! I love, love, love, the tone on tone sun rays. It's so CAS yet stunning. Brilliant! Great card--I like the sun rays. Great card, love the rays of sunshine! I like! What a great idea to have the rays with that sentiment in the center - just brill! This looks amazing, even in it's simplicity! this is gorgeous! Love the sun being made out of the sentiment! This is super! I love those big rays and that sentiment is perfect! Really sweet. Love the tone on tone. What a cute sunshine card. Sunshine on the cards makes me happy...beautiful. Great card again! Thank you so much for your tip in creating the sun rays behind your sentiment! I'm sooo going to try that!!! Very sweet and creative card. Where are my sunglasses?!?!? Love your rays. How 'bout some square cards?